Updated Tuesday May 8, 2018 by WRA Editor. 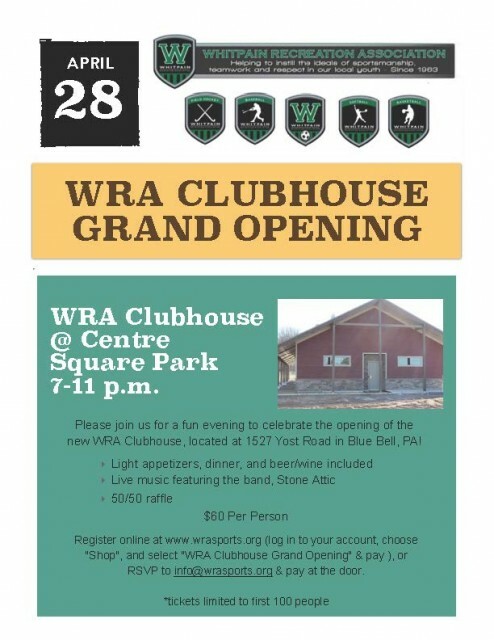 Please join us for the Grand Opening of your WRA Clubhouse at Centre Square Park on Saturday April 28, 2018 at 7PM. The WRA Clubhouse will serve as the new home of the WRA. Tickets are $60 each, and include light appetizers, dinner, beer and wine, and Live Music from Stone Attic! Tickets are available on the WRA website in the WRA Shop. Log in to your account, click on "Shop" and purchase tickets using your WRA account. Tickets are limited to the first 100 registered guests. If you can't purchase tickets on the website, please email info@wrasports.org to RSVP. All proceeds from the event benefit the WRA. Proceeds will help pay for the WRA Clubhouse building and fit-out. If you can't attend, please consider making a contribution to the WRA Clubhouse Building through the WRA Shop or by contacting Pat Foley at pfoley@rwbaird.com. WRA is a 501(c)(3) non profit so contact your tax advisor to see if your contributions are tax deductible. WRA is also soliciting in-kind contributions to fit out the new building. This includes tables, chairs, book cases and other furniture; and kitchen equipment and appliances. Please contact Pat Foley at pfoley@rwbaird.com. WRA is grateful to Pat Foley for spearheading the design and construction project over the past several years, and to our friends at Whitpain Township, and especially the Public Works and Parks and Recreation Departments, for their leadership and active involvement in all aspects of the project. WRA also thanks Thompkins VIST Bank; Nayan Shah of Paradigm Architecture; H&H Construction; Michael Addesso Marble & Granite World; Michelle DiNicola Color & Design; and many others whose efforts will be highlighted soon for their contributions to the successful completion of this major project. WRA also wishes to thank Maguires Market, Stone Attic, Pat Walsh (Miller/Coors Beer) and Tom Garvey (Wine) for their contributions to this event. We look forward to seeing you on Saturday April 28, 2018. Intramural Soccer provides a fun environment for kids to learn and enjoy soccer. Summer Travel Baseball Tryouts for 9U and 8U boys will be held on April 28th at 2pm and 5:45p - Wentz Lower Field. To be eligible to play for WRA travel baseball, you must be registered for rec WRA baseball. Travel team tryouts for 15 to 19 year old boys. No fees due until after you have tried out and been selected for a team. Bambino Buddy-Ball allows intellectually challenged or special needs athletes to develop confidence and positive self-esteem while playing and learning the fundamentals of baseball and softball. Registration is for children that tried out for a travel soccer team and were invited to be rostered by the head coach or an administrator of the Travel Soccer program. Financial Assistance is available - please contact a Coordinator. Requests will be kept under strict confidence. No refunds will be honored after acceptance of a position with a Travel Soccer team that results in another athlete having to be cut due to roster limitations. Extenuating circumstances may be considered by the Travel Soccer Coordinator or Boys/Girls Coordinator upon written request. Suburban Travel is a spring travel league of neighboring townships. This is a competitive league and players must be chosen to play. WRA Softball is or girls ages 7 through 12. External links are provided for reference purposes. Whitpain Recreation Association is not responsible for the content of external Internet sites. Copyright Whitpain Recreation Association All rights Reserved.